Physiotherapist (and Irish international) Matt Bergin talks us through the dreaded world of shin pain. Starting with what happens, why it happens and finishing with how to treat it. A week rarely goes by where I don’t get someone telling me they have shin splints. It is one of the most common injury related phrases heard in the running world, so you would think it is fairly well understood, but often this isn’t the case. This isn’t just something I see in those new to running either. I see it across the board. From people just starting out at parkrun all the way through to the elites. So what actually is shin splints? The term ‘shin splints’ isn’t so much a diagnosis, rather a part of one of four conditions affecting the medial shin area, most commonly. Shin pain can be broken down into four general categories; muscular, bony, neural and vascular. Often muscular shin pain can be caused by strain or excessive tightness to a number of muscles occupying the medial shin area. Their attachment to the bone via a structure called the periosteum can become irritated and inflamed (periostitis). If these structures continue to be overworked and overloaded bony stress injuries can occur (reaction/fracture). There are also several other conditions which can manifest themselves as lower leg/shin pain. None of which should be overlooked. These include types of compartment syndrome and nerve related issues such as nerve entrapments in the lower leg, or referred neural issues from the lower back. To make our lives more difficult you can have combinations of these. First we will focus on the most common, the muscular type injury. Differentiating between these conditions can often be difficult, no less because they often co-exist. However, there are subtle distinctions in the presentation and behaviour of each. This helps to guide the treatment and rehab. The most common type of shin pain I see is caused by excessive tightness or strain to the muscles occupying the medial shin area. Namely the tibialis posterior and soles muscles. As well as occasionally several other muscles in the area responsible for flexing of the toes. You can also develop inflammation to these muscles points of attachment to the bone via a structure called the periosteum (periostitis). Tibialis posterior/soleus pain is felt as a dull pain or real tightness typically along the distal 1/3 of the inner shin, into the soft tissues behind the bone. A soft tissue problem generally won’t be painful at rest. But will be most sore at the beginning of a run and will often get easier as you get moving. You then have the bony type injuries, the two words that put fear into ever runners minds… stress fracture (or reaction). To briefly explain the process, our bones are constantly being remodelled to adapt to the stresses and loads placed upon them. If the level of stress being placed through them is greater than the rate at which the structures adapt, an area of bone weakness will develop. When the excessive stress continues the bone may fracture microscopically – this is when you experience pain. Ignore the pain and continue to stress the area then it can develop into a larger crack. Eventually, a stress fracture will happen. Similar to the muscular type pain the most common location for stress reaction/fracture is the lower part of the inner shin. There will be a specific point of tenderness on the bone and in contrast to the muscular type injury this will be felt over a much smaller area – maybe 1-2cm. Another give away is the behaviour of the pain. With a stress reaction, the issue will worsen as you run and will feel worse after, and you may even experience a deep ache, or throbbing type pain at rest or at night in the more developed (stress fracture) types. Where things can get confusing is the involvement of the periosteum (periostitis) – which is often understood to be part of a process called ‘Medial Tibial Stress Syndrome’ (MTSS) the term now more commonly used in place of ‘shin splints’. Due to the rich nerve supply of the periosteum the bone will be exquisitely tender to touch, however, this will generally be felt over a larger area. There will not be the one to two centimetre focal point of tenderness as in a stress fracture. Some view this as a part of the stress reaction/fracture pathway, while others view it separately. Shin pain of bone, muscle or inflammation of the periosteum often have similar causes. As a physiotherapist the aim is to figure out what factor(s) have contributed to an excessive amount of stress being placed through the medial shin. The simple things should not be overlooked. “Too much too soon” or footwear that should have been changed months ago. But also things like changes in running surface, e.g. more running on concrete, running on a camber, more track running. All such things will impact the way we run and the stresses and strains placed through the body, especially the medial shin. There are however some common biomechanical issues that can cause medial shin pain. The most common is over-pronation, the rolling in of the foot. This pattern of over-pronation can happen higher up the chain as well, with excessive internal rotation of the leg as whole. This lack of control on impact places a torsional (twisting) stress through the inner part of the shin as the foot collapses and the knee drifts inwards. It’s overloading the inner shin muscles – namely the tibialis posterior – which coincidently controls pronation. Weakness in this muscle, along with the lateral glutes (you’ll hear this a lot) will often leave you with this pattern of movement. There are a few simple tests you can do yourself, which may be revealing…. Standing in front a mirror or recording on your phone, perform a few single leg knee bends. Watch what happens to the foot and knee. Then do the same but hopping this time, what happens. What you are looking for is the foot to maintain a strong arch, the knee to travel over the middle of the foot and also for the pelvis to remain level. With the outward force being applied by the tester, the foot should hold strong. If the tester is able to easily move the foot it simply isn’t strong enough. When we run we put somewhere around there to four times our body weight through the legs. If you cannot resist a friend pushing your ankle out, imagine what is happening when you run? The more lateral gluteal muscles are of particular importance. They are holding the knee over the middle of the foot on impact. Side-lying, lifting the test leg up and backwards (behind the line of the body), you should hold strong to a downward applied force. There must be no rocking back of the pelvis/trunk or bringing forwards of the leg – these are all cheating mechanisms to overcome the weak lateral gluteal muscles. As well as having the strength in these muscles we also need to have adequate flexibility, particularly through the calf, foot and ankle to allow for load absorption on impact. If there is a restriction in ankle range, either due to calf tightness or ankle stiffness the foot will often over-pronate, or externally rotation (turn outwards) to overcome the lack of range. This will cause a much greater torsional stress through the medial shin. If you have been working on these areas and you still feel you aren’t getting anywhere it is worth looking at several other areas. I would recommend routine assessment by any qualified physiotherapist you may visit. Restrictions through the hip, issues in the sacroiliac joint (SIJ) and lower back can all also be contributing factors. The often co-existing and overlapping nature of medial shin pain is what makes it so difficult to treat. It’s why people so often find themselves suffering with it time and time again. Even when doing what they think (or have been told by Dr Google) are the right things. If there is any concern that you may have sustained more of a bony type injury my advice would be to get it properly checked out. Despite the fact I have just written heavily about the issue, do not solely rely on the internet for help. Once the underlying cause of your shin pain has been determined, the rehabilitation can take a number of routes. If the issue is bony in nature (i.e. stress reaction or fracture) you will require rest, somewhere between four-eight weeks depending on the severity of the injury. More detail of stress fracture management and rehabilitation will be discussed in later pieces. If the issue is muscular in nature, or irritation to the periosteum, you still need to be sensible. Symptoms are often ignored in the early stages. It might just be that the pain is felt as an occasional tightness and soon disappears once you get running. But the sooner you take action the better. If these early signs are ignored and the feeling of tightness becomes more consistent you will likely require some rest. This is simply overloading the tissues and a more serious injury will develop if ignored. In order to address the issue, treatment will be focussed on correcting all the weaknesses, areas of tightness, and biomechanical faults that have been identified. The tibialis posterior muscle is largely responsible for controlling pronation of the foot on impact, so it is essential this muscle is strong. I would aim for three sets of around 15 repetitions. Alternatively, you can perform the same exercise in the gym using a pulley machine. When running the lateral glute muscles are responsible for controlling the internal rotation of the hip on impact. Weakness here will often leave you with the movement pattern shown above. There are many many ways of building strength through these muscles, but the more functional you can make it to running, the better. 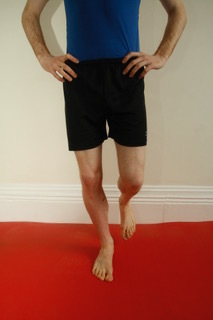 Standing on the affected leg, with the opposite leg against the wall. Keeping the foot pointing forwards, slightly bend the standing knee and turn it out over the foot so that you can see several toes inside the knee, as you look down. Push the leg into the wall and hold strong through the standing leg. Initially, I would aim to hold for at least 30 seconds, but quickly working up to two-three minutes. Once the initial strength through these muscles has been well developed you should then look at building to more running specific exercises. These can include single leg control drills such as hops, bounds, lunges etc. It is this initial strength, coupled with the running specific drills that, over time, will transfer into your running. This then reduces the chances of developing such injuries. It is also worth assessing the range through the calf muscle as tightness here will force the ankle into a more overpronated position on impact, as the knee moves over the foot, again stressing the medial shin area. 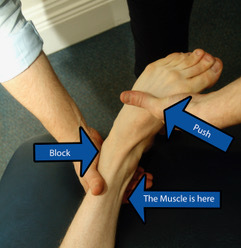 In terms of self treatments, it is worthwhile getting fingers and thumbs through the inner, muscular part of the shin. Just a few minutes, every day or so, to free off any of the tightness can help. The strengthening exercises will take a few weeks to show initial improvement. Thus some deep tissue work is a good place to start in the meantime. 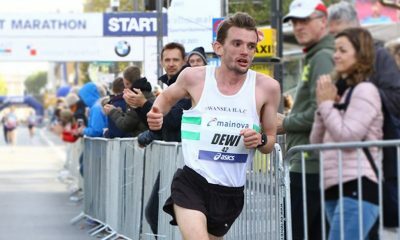 Matt Bergin is an international middle-distance runner for Ireland and physiotherapist at leading UK practice Witty, Pask and Buckingham, specialising in running injuries. You can find out more at www.wpbphysio.co.uk.